Another good thing is that if your system crashes, or accidently turns off, secret disk automatically locks your hard disk at boot up. So, it is very safe. One thing that I need to mention is that Secret Disk does not encrypts your files – it just stores them in a separate area on hard disk which is password protected. However, if some professional tries to get to your files, then he/she might be able to do that. So, this disk password protection software is good enough for normal user, but might not be secure enough to protect your sensitive documents. The strength of Secret Disk lies in the fact that it is simple to use, works well, and is totally free. Download using links at the end. 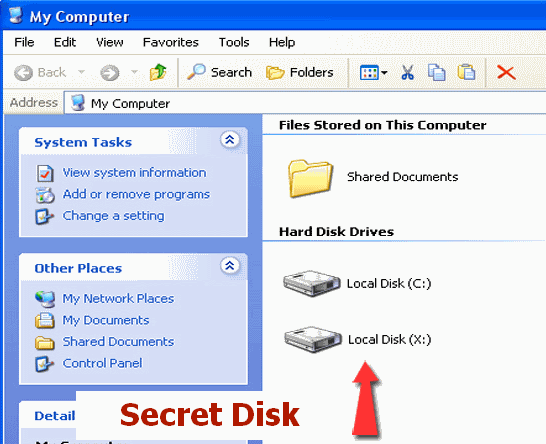 Secret Disk is a simple and free software to password protect your hard disk. What it does is sets a separate portion aside on your hard disk. That portion of your hard disk appears as a separate drive. Everything in that whole drive is password protected. You can lock and unlock that disk by a single password. Whenever you lock your password protected hard disk, it won’t even appear in your system! To see that drive, and all the files under it, you will just need to open Secret Disk program and enter your password. 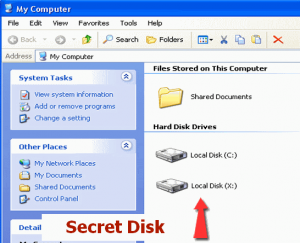 When it is in locked mode, Secret Disk does not even appears in system tray. So, it is hard to know that this disk protection program is running. Another good thing is that if your system crashes, or accidentally turns off, secret disk automatically locks your hard disk at boot up. So, it is very safe. This free software will create separate disk for your private files. Space for secret disk will be taken from your system disk. You can access Secret Disk with a password only. When you need protection Secret Disk disappears within one second with all content, no matter how many files you have on the disk. When you lock your secret disk, it disappears and stays invisible with all contents. In case of power (or Windows) failure Secret Disk will be automatically locked. Secret Disk can be automatically locked if you away from your PC (screensaver is running) or when you press emergency F8 button.